As Prime Minister Ariel Sharon clears the final political hurdles in his plan to remove more than 8,000 Jewish settlers from Gaza and from four northern West Bank settlements, here is an overview of Israeli and American policy during nearly four decades of settlement expansion in the West Bank and Gaza. In July Yigal Allon, head of the Ministerial Committee on Settlements, starts developing a plan for settlements in West Bank areas. While not formally approved by Prime Minister Levi Eshkol's National Unity government, it becomes the framework for the Labor Party's future settlement planning. Citing security needs, Allon calls for settlements in outlying areas including the Jordan Valley and Judean Desert and avoiding areas that are heavily populated by Palestinians. Israel begins establishing civilian settlements supported by the government and by non-governmental settlement movements. In June, Foreign Minister Abba Eban says: "We need a better security map, a more spacious frontier, a lesser vulnerability." In the aftermath of Israel's takeover of Arab territories following the June 1967 war with Egypt, Jordan and Syria, the U.S. endorses a land-for-peace trade to resolve the Middle East conflict. The U.S. opposes the establishment of Jewish settlements in the newly-occupied territories, maintaining they will be obstacles to peace. But under Presidents Johnson, Nixon and Ford, not much is done to press this policy. Following the death of Levi Eshkol, Golda Meir becomes prime minister. She continues the settlement policy outlined in the Allon plan. There are eight Jewish settlements established in the West Bank. Prime Minister Golda Meir states: "The frontier is where Jews live, not where there is a line on the map." Approximately 1,500 Jewish settlers are living in the West Bank and Gaza Strip. In September Defense Minister Moshe Dayan says, "Gaza will not be Egyptian.The Golan will not be Syrian. Jerusalem will not be Arab. A Palestinian state will not be established. We will not abandon the settlements we have established." In October, in a surprise attack on the high holy day of Yom Kippur, Egypt and Syria unsuccessfully attempt to reclaim the Sinai Peninsula and Golan Heights. Israel maintains control of the areas. Says Yigal Allon, "The lesson we learned from the war was that every single settlement should be fortified as if it were a military fortress." Golda Meir resigns as Prime Minister in favor of Yitzhak Rabin, whose Labor government continues with the Allon settlement policy. During his term in office, Rabin is pressured by hardliners to pursue a more aggressive settlement policy. Touring the Jordan Valley in the West Bank in 1976, Rabin states: "These settlements are here to stay for a long time. We don't establish new villages only to pull them down later." Fourteen settlements are now established in the West Bank. Settlement in the West Bank. The Likud Party comes to power for the first time with Manachem Begin as prime minister and begins a drive for increased settlements in the West Bank and Gaza in the name of Greater Israel. In June, Prime Minister Begin states: "Israel will not be able, under any circumstances, to withdraw to the June 4, 1967 lines, and will not do it. … We will not agree under any circumstances that in Judea and Samaria and the Gaza Strip, a state called Palestine will arise. …"
In September Minister of Agriculture Ariel Sharon unveils "A Vision of Israel at Century's End," a proposal for two million Jews to live in the occupied territories that builds on existing plans for additional settlements, homes and infrastructure. The plan favors the western slopes of Samaria in order to divide Palestinian population areas and offers many incentives for Israelis to move to settlements. "Make no mistake about it, this government will establish many new settlements. That's what it was elected to do and that's what it will do," says Sharon. Approximately 5,000 Jewish settlers are living in the West Bank and Gaza; 33,000 reside in East Jerusalem. In 1977 President Carter publicly calls Israeli settlements "illegal" under international law. The following year, the historic 1978 Camp David Accords are signed between Prime Minister Begin and Egyptian President Anwar Sadat, normalizing Israel's relations with Egypt and restoring Egypt's sovereignty over the Sinai Peninsula. At the conclusion of Camp David, Carter believes that he and Begin have agreed that further settlement activity will be frozen while negotiations continue on finalizing all elements of autonomy for the Palestinians. Carter later will say that he "misunderstood what Prime Minister Begin said" regarding settlement activity. Israel continues building settlements in the West Bank and Gaza Strip. The Israeli cabinet passes a law allowing Israelis to purchase land in the occupied territories. The Likud Party is reelected by a large margin, due in part to a platform emphasizing its successes in settling the West Bank. Begin sees his win as a mandate to keep aggressively building settlements. The government offers low-interest mortgages to prospective settlers, attracting interest from more secular Jews. In August Begin says: "Western Eretz Yisrael is entirely under our control. It will never again be divided. No part of its territory will be given over to alien rule, to foreign sovereignty." Begin resigns as prime minister and Foreign Minister Yitzhak Shamir is named interim prime minister. A July 1984 election ends in a tie between Likud and Labor and Shamir and Labor's Shimon Peres share power, each serving a 25-month term as prime minister, with Shamir serving first. Their National Unity government returns to the Allon plan and resources go to existing settlements, as progress slows on building new ones due to economic strains. 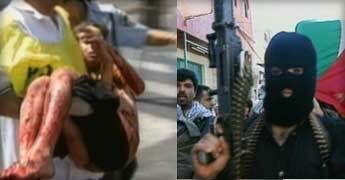 In 1987 the first Palestinian Intifada erupts. In November 1988 the national election is again split between Likud and Labor. A National Unity government is formed with Shamir serving as prime minister the entire term. His Likud government focuses on expanding existing settlements. 42,000 Jewish settlers are living in the West Bank and Gaza, a 100 percent increase since 1982. Not long after taking office, President Reagan states that Israeli settlements are not illegal and over the eight years that follow, his administration makes no significant effort to try to bring about a change in the Likud government's pro-settlement policy. However, during those years Reagan's State Department calls the settlements "an obstacle to peace." With 150,000 Soviet Jewish immigrants expected to begin arriving in Israel, the U.S. and Israel get into a dispute over whether the new immigrants will be sent to live in settlements in the West Bank, Gaza, or East Jerusalem. In March, Labor walks out of the National Unity government after failing to reach an agreement on a U.S.-proposed format for peace negotiations. Shamir installs a new right-wing government committed to establishing settlements in the West Bank and Gaza. Ariel Sharon becomes housing minister. Approximately 72,800 settlers are living in the West Bank and Gaza Strip. In the early months of the Bush administration Secretary of State James Baker calls on the Israeli government to "lay aside the vision of Greater Israel, stop settlement activity…" During his presidency, George H. W. Bush calls the settlements an "obstacle to peace." 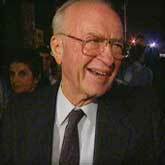 In July Labor's Yitzhak Rabin wins a narrow victory over Shamir and becomes prime minister. His election campaign pledged to reduce resources going to settlements and as prime minister he agrees to halt the establishment of new settlements. But settlement activity is not completely frozen. The government permits completion of 11,500 housing units begun under the previous government and an exception is made regarding "natural growth," meaning housing expansion due to natural population growth in existing settlements. Approximately 110,000 Jewish settlers are living in the West Bank, Gaza Strip and East Jerusalem. In 1992 President Bush demands a total freeze on settlement housing being built or planned before allowing $10 billion in U.S. loan guarantees for Israel. In response, the Israeli government announces a freeze and the loan guarantees are granted. But going forward, the Bush administration decides to deduct $400 million, the amount that Israel spends on settlement activity, from U.S. loan guarantees. The signing of the Oslo Accord. A month after the Oslo Accord, Prime Minister Rabin says: "Settlements, especially in the densely populated area that I used to call political settlements, were not established from any security point of view. Their whole purpose was political, to make any solution almost impossible. This was the idea of the Likud." President Clinton pledges to follow George H.W. Bush's policy on deducting from U.S. loan guarantees to Israel the amount of money that is spent on settlements. Over the eight years of the Clinton administration the Oslo peace process struggles along as Palestinian and Israeli negotiators try to reach an agreement that could end the 100-year Middle East conflict. In the many carefully negotiated agreements there are positive developments, but also severe setbacks. Deeper and deeper mistrust grows on both sides. Palestinians accuse Israel of failing to stop expanding Jewish settlements and stalling on agreed withdrawals from West Bank territory. Israel accuses Arafat and the Palestinian security forces of not cracking down on attacks from militant groups trying to sabotage the peace process. Approximately 138,000 settlers are living in the West Bank and Gaza Strip. Two months after Oslo II, a Jewish religious extremist assassinates Yitzhak Rabin. Shimon Peres becomes Labor's new prime minister. The Likud Party's Benjamin Netanyahu is narrowly elected prime minister in May. In his election campaign, Netanyahu promised to increase the number of settlers in the West Bank. In his inaugural speech to the Knesset, Netanyahu says, "Zionism is not dead. …We have a wonderful youth, willing to mobilize for national tasks. … We will encourage this spirit; we will encourage pioneering settlement in the Land of Israel: in the Negev, Galilee, Judea and Samaria, and the Golan. The settlers are the real pioneers of our day, and they deserve support and appreciation. But above all we will guard and strengthen Jerusalem, the eternal capital of the Jewish people, undivided under the sovereignty of the State of Israel." Jewish settlements are built and expanded during Netanyahu's term. Roughly 148,000 settlers are living in the West Bank and Gaza. At a December news conference, President Clinton criticizes Prime Minister Netanyahu's campaign to encourage Jewish settlements. (A week before Clinton's statement, Israel had decided to reinstate financial subsidies to Israelis building homes and businesses in the West Bank.) Says Clinton: "I don't think anything should be done that would be seen as pre-empting the outcome. ..."The [Oslo peace] talks are at a critical juncture... The situation is full of tension, and frustration. They've had an agreement within grasp, with very little difference, on Hebron, for some time now. The time has come to make that agreement. But I don't think that on the settlement issue, anything should be done which would, in effect, be seen as preempting the outcome of something they've already agreed should be part of the final negotiations. And we've had a very clear position on that all along." 183,000 Jewish settlers are living in the West Bank and Gaza Strip. In May Labor's Ehud Barak, running on a platform of peace and security, defeats Netanyahu and is elected prime minister. A month later, Barak states, "When I say that we should not settle on another hill near Efrat or Bet El, I don't say it because we do not have such a right, or that we stole something there from someone. Just the opposite. We have a complete right to settle there. We didn't steal anything from anyone. We have deep ties with these places. So when I suggest to weigh withdrawing from a certain hilltop, it is because I want to increase the chances of creating a stable equilibrium between us and the Palestinians that will protect both of our vital interests." In December Barak states: "The government position has always been, since its establishment, to permit only the natural growth of the settlements." 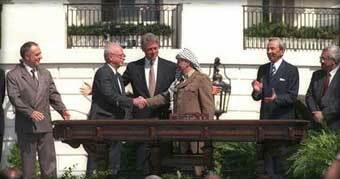 With the Oslo peace process increasingly in jeopardy, in mid-July, at the urging of Prime Minister Barak, President Clinton hastily convenes a summit at Camp David with Barak and Yasser Arafat. The summit suddenly opens up the toughest, most sensitive "final status" issues previously not discussed during the Oslo process: permanent borders, refugees, Jerusalem and the settlements. The Camp David Summit collapses amid accusations of bad faith from both sides. In September the Second (Al Aqsa) Intifada begins. See a chronology of the cycle of violence that follows. In February Likud's Ariel Sharon, running on a platform emphasizing security, is elected prime minister, defeating Ehud Barak in a landslide. A longtime proponent of settlements, he states two months after his election: "It's not by accident that the settlements are located where they are. They safeguard the cradle of the Jewish people's birth and also provide strategic depth which is vital to our existence. The settlements were established according to the conception that, come what may, we have to hold the western security area, which is adjacent to the Green Line, and the eastern security area along the Jordan River and the roads linking the two. And Jerusalem, of course. And the hill aquifer. …Nothing has changed with respect to any of those things. The importance of the security areas has not diminished, it may even have increased. So I see no reason for evacuating any settlements. In any event, as long as there is no peace, we are there. And if in the future, with God's help, there is peace, there will certainly be no reason for not being there. " 205,000 Jewish settlers are living in the West Bank and Gaza. In June Prime Minister Sharon approves the Defense Ministry's proposal for a security fence to be built between Israel and the West Bank. In April 2002 President Bush makes headlines when he calls on Israel to act swiftly to lift pressure on Palestinians in the West Bank and halt Israel's military occupation of urban areas and stop settlement activity. Over the following months, Bush will repeat his words about "Israeli settlement activity." 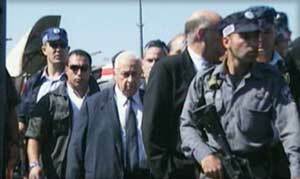 In January Ariel Sharon is reelected prime minister. 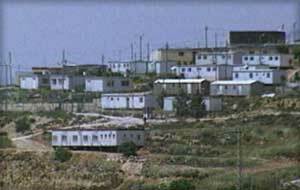 During 2003, Israel's Ministry of Construction and Housing decides to finance the buying of caravans or light mobile homes by regional Jewish councils in Judea, Samaria and Gaza at a cost of $8 million, according to the government-sponsored report, "Opinion Concerning Unauthorized Outposts" that is released in 2005 and authored by former Israeli state prosecutor Talya Sason. Roughly 150 Jewish settlements are scattered throughout the West Bank and Gaza. The number of settlers totals approximately 230,000. In April President Bush formally presents to Palestinians and Israelis the U.S.-backed plan for peace, known as the "Road Map." The plan, jointly agreed upon by the U.S., the European Union, Russia and the UN, calls for reciprocal concessions aimed at leading to a comprehensive Arab-Israeli peace in 2005 and a two-state solution as envisioned in the 1993 Oslo Accord. In the first of its phases, the road map calls on the Palestinian Authority to rein in terrorist groups and states that Israel "immediately dismantles settlement outposts erected since March 2001" and "freezes all settlement activity (including natural growth of settlements.)" In November the Bush administration announces it will deduct roughly $290 million (from a total of $9 billion in loan guarantees to Israel over three years) to penalize Israel for the construction of the separation fence and new settlement building. The action is required by a congressional law passed eight months earlier stipulating that U.S. aid be reduced by what Israel spends on certain activities in the West Bank. In an April letter to President Bush, Prime Minister Sharon outlines his plan to evacuate settlers from Gaza and in some parts of the West Bank. The plan he says, is "designed to improve security for Israel and stabilize our political and economic situation." In an April letter to Prime Minister Sharon, President Bush says he recognizes that certain "settlement blocs" will fall under Israeli control even after a final peace deal with Palestinians is reached. Sharon believes the letter represents tacit U.S. support for his plans to strenghthen Israel's hold on the largest settlements. In a speech in the city of Ashdod on April 20th, Sharon says, 'The understandings also ensure our national interests, to strengthen the large settlement blocs in Judea and Samaria, and leaving them in Israeli hands as part of a permanent solution." In March Israel approves the expansion of Maalah Adumim, the most populous settlement in the West Bank and located seven miles from Jerusalem. 3,500 new housing units will be built, making it the largest settlement housing project in years. Also in March, the government-sponsored report, "Opinion Concerning Unauthorized Outposts," is released. Authored by former state prosecutor Talya Sason, it reveals that agencies throughout the Israeli government were aware of the establishment of illegal settler outposts in the West Bank and Gaza starting in the mid-1990s, and in some cases these agencies supported those outposts financially. Sason estimates there are roughly 105 unauthorized outposts. Approximately 250,000 Jewish settlers are living in the West Bank and Gaza. In a February speech in Belgium, President Bush says Israel must "ensure that a new Palestinian state is truly viable with contiguous territory on the West Bank. … A state of scattered territories will not work." On March 25 Secretary of State Condoleezza Rice criticizes Israel's plan to expand the West Bank settlement of Maale Adumim. She says the plan is "at odds with American policy."